Chemokines are chemotactic cytokines, which primarily control the migration but also the activation and differentiation of all subsets of leukocytes and play important roles in angio-genesis, organogenesis, and carcinogenesis . Chemokines act through a large family of G-protein-coupled receptors, which are divided into subfamilies of CXC, CC, and CX3C receptors. This nomenclature refers to a fingerprint sequence in the ligands where the first two Cys residues are either neighbors (CC) or separated by one (CXC) or three (CX3C) residues. Although a few chemokine receptors are regulated by only a single chemokine protein, the system is generally characterized by a high degree of redundancy, in which a given chemokine receptor is activated by more than one ligand and a given chemokine acts through more than one receptor within a chemokine subfamily. Thus, the chemokine system is not only the key to the control of the immune system, but it is also an optimal target for viral exploitation, due to the redundancy among multiple endogenous proteins. Figure 1 Structural relationship between herpesvirus-encoded chemokine receptors (A) and highly constitutive but regulated signaling of the prototype virus-encoded receptor ORF74 (B). In the dendrogram of herpesvirus-encoded chemokine receptors structural groupings are marked with shaded areas and receptors with known constitutive activity are highlighted. Panel (B) shows how the high constitutive signaling of the most well-characterized virally encoded receptor, ORF-74 from HHV8 (Kaposi's sarcoma-associated herpesvirus), is tuned by angiogenic chemokines acting as agonists and by angiostatic/angiomodulatory chemokines acting as inverse agonists. and tyrosine kinases, which link the receptors to activation of small GTP-ases . 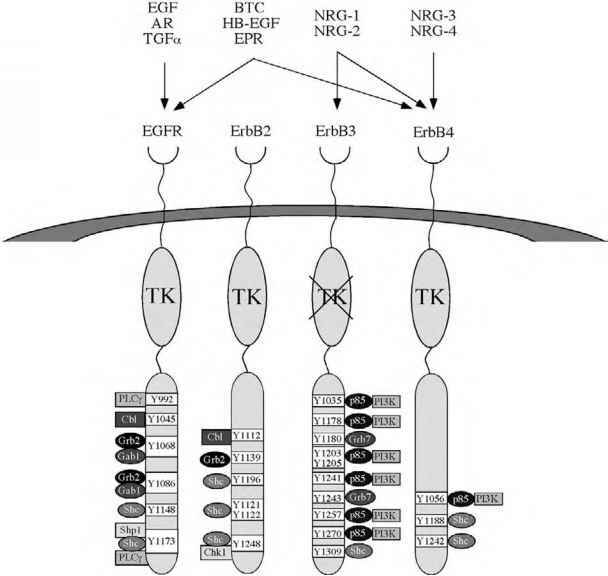 Endogenous chemokine receptors are strictly ligand regulated and normally do not display constitutive signaling activity. This is in accordance with the fact that the receptors are involved in directional migration (i.e., chemotaxis), controlled by a chemokine gradient built in the interstitial tissue through attachment of the secreted chemokines to glycosaminoglycans. Constitutive signaling of a chemokine receptor in a migratory cell would conceivably lead to chemokinesis (i.e., undirected cell movement), which perhaps in conjunction with binding to cell adhesion molecules could be useful in the extravasation process.